Save Palm Trees - Universal Landscape, Inc. When palm trees are experiencing unusual stress at any point during their life in a residential or commercial landscape, one of the main visible effects can be that the center stalk (center fron), the center growth point at the top of the palm tree, is not growing as it should. The center stalk can look stunted, or new growth is not occurring or is beginning to turn brown. This is one visible sign of a palm tree that is in stress, and it could be occurring from a number of reasons; ie. Insects, fungus, watering issues, lack of nutrients, etc. When the palm trees are going through a difficult stress that results in a visible difference in the crown or center stalk of new growth, depending on the severity, they may or not make it through – with – or without assistance – depending on what is causing the tree to become sick or stressed. This Article is intended to help provide steps to recognize and help save palm trees that may be struggling to survive. There is a difference between palm trees experiencing an occasional stress which can occur at times from transplanting or new landscape installation and those palm trees that have been established and are struggling to survive in a landscape. Upon installation of palm trees, especially those that are field grown, typically larger palm trees that were cut out and removed from the ground before the new installation, it is not very uncommon to see some bottom frons, the lower hanging branches to turn brown. If it is one or a few frons that are turning brown, depending on the palm tree, these should be just cut off from the tree and disposed of. If you are not sure and you are a customer of ours, it is a good idea to call us or send a photo of the tree through email to Universalland75@aol.com and we can advise or make a visit if necessary. 1) The type of palm, if it is cold hardy in a tropical zone or more cold sensitive. 2) The time of year. If it is a) a palm tree that is sensitive to the cold and it is winter, it may be advisable to trim some of the dead or browning fron, but leaving the stalk that connects to the tree untouched until the cooler weather may be over. For many palms, you can simply trim of the dead or browning palm fron from the tree completely, as most often the browning of the frons can occur during the installation phase and will show in the first weeks after the new palm tree is installed in its new landscape home. The Reason Browning of Palm Frons can occur at times in a new installation : These larger trees have had their roots cut, which is the main supply of nutrients to the tree. Many trees may go through very little difficulty as the roots re-grow and increase their nutrient supply in their new home, your property. For a short period, the palm tree is not receiving the same quantity of nutrients, similar to being on a diet for a short time, and this can be reflected in some lower fron stress from time to time. As all our material is warrantied, you needn’t worry, just follow our watering and fertilizing guides, read through the information as listed here as an on-line support, and we are behind everything – as we have a vested interest in the success of your landscape. Again, contact us if after reading you are not sure, or you can also email a photo to help us provide more immediate support. From the time of installation throughout a palm tree’s life – there are a number of factors that can lead to a decline in the trees health, as mentioned above. Leading factors : Lack of water, Overwatering, Lack of nutrients, disease or pests. First thing to do is to check your watering schedule. At the immediate time after installation is the greatest requirement of water. Daily for at least the first two weeks, from 45 minutes to an hour daily, early morning is best. This can be increased or decreased depending on the drainage qualities and nutrient levels of your soil. After the first two weeks – the next period or level is through the first three months. After the first three months, the landscape is usually in the clear as if there are any factors that stress a tree it usually happens during this period. The watering should be at least every other day during this three month period, after reducing from the first two week daily watering. Same length of time, adjusting as necessary. If your palm trees are established, 6 – 9 months or longer, and you begin to notice a decline in their health, the first thing to check is the watering schedule. 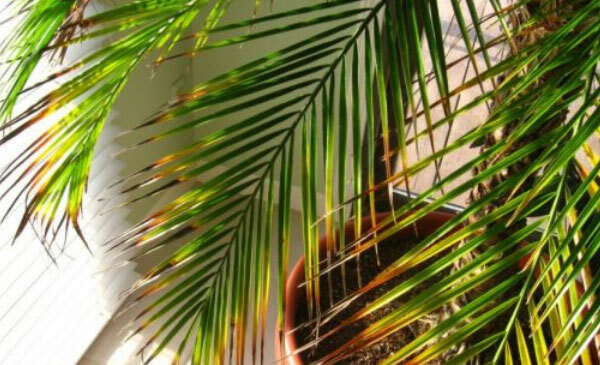 Even if a palm tree has been established for many years and you begin to notice a decline in health, wilting or discoloration – the first thing to check is the watering. The second thing to check is the amount of fertilizer the palms have been receiving. Most often, people are not fertilizing as they should. Instructions are also available on our site in our article titled “An Introduction to your landscape”. We also offer free email reminders to notify you of optimum times to fertilize during the year. A third thing to check is for insects. If you see any insects or unnatural growths on your tree you may be wise to call a pest control company immediately, and we can also refer a professional to you if you like. A fourth thing to check, (not necessarily in this order entirely), is for poor drainage or too much water retention in the immediate area. If you see mildew or green mold on the ground, you definitely have too much water retention. This can be a result of some different factors such as dense soil conditions, poor grading of the bed areas for drainage; poor property drainage – just to mention a few immediate and more common causes of root rot from too much water. When the Center or Crown Stalk is hurt, the vascular system of the tree is having difficulty pulling nutrients up from the roots, then through the tree’s heart and feeding the top and new growth. Similar the way nutrients move through a human body, the tree ‘eats’ or absorbs water & nutrients primarily through the soil, while also having the ability to absorb water or nutrients through the palm frons and the body of the palm tree. When the top of the tree’s center stalk, and frons are going through a visible stress, they may be fed from the top, or the crown or center stalk frons area – to help rejuvenate the palm tree back to health. This is called feeding the tree ‘Systemically’. Nutrients can be fed to the tree in a liquid form, often times a mixture of multi-vitamins can be a good start. Regular ‘B Vitamins’ and Magnesium Sulfate (or Epson Salt) can be a great help with transplanting also. Different professionals may recommend different blends of vitamins or products, and at times, not all products can be purchased without being a licensed professional, educated in the trade of pesticides, insecticides, etc. These ingredients were mixed together and used by pouring or spraying with a regular bug spray container that you can purchase at a typical outlet large garden center. The contents can be sprayed or poured from a container onto the top of the palm trees center stalk, and also applying around the base. It is recommended not to ingest or get any of the mixture on – the skin, eyes or mouth and to take the necessary precautions, gloves, mask, etc. . If you do get any of this mixture on your skin, in your eyes or ingested and are experiencing a reaction – you do so at your own risk and are advised to Contact a Doctor immediately. If you have trouble finding some of the ingredients in your area at a consumer level, call a quality fertilizing & pest control company in your area for help if necessary. When Applying : If you are doing the mixture yourself, the B Vitamins, Iron, Multi – Micronutrients & Macro-nutrients and some regular dish washing soap such as ‘Dawn’ dishwashing liquid in a minimal amount should be helpful. If you pour the mixture, or spray through the hand held nozzle ( a pump spray canister is recommended) make sure to saturate the growing points of the palm tree. Saturate the center stalk, the interior head of frons surrounding that center point and you can also spray it on the tree trunk and saturate the soil also. As mentioned above, the vascular system of the tree may be in stress or struggling, so feeding it through the top (systemically) is another way to get nutrients to flow again through the palm tree’s vascular system. When applying the liquid mixture should be applied to the top, crown shaft, center stalk area of the palm tree – the area where the new palm frons are coming out from the top of the tree. When applied there, the liquid is able to be absorbed into the new shaft area, and travel downwards through the heart and vascular system of the tree. Also, it is helpful to provide some of the liquid mixture around the base of the tree, to help rejuvenate the root intake also. For further information on mixtures check our Helpful #’s page of Horticulturists ‘Hotlines’ that are tied into consumer support and freely available as part of University Horticultural programs. The phone numbers are listed on our ‘Customer’s Corner’ Page of the site.